Otolaryngology Update: Francis Marchal,MD, Consultant ENT Surgeon and Lecturer, University Hospital, Geneva, Switzerland. 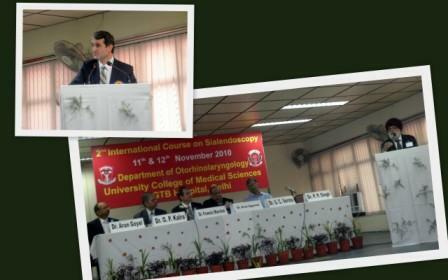 Francis Marchal,MD, Consultant ENT Surgeon and Lecturer, University Hospital, Geneva, Switzerland. 2nd International Course on "Sialendoscopy"
Miniaturization of endoscopes and progress in fiberoptic technology enabled several researchers in the 1990s to expand the uses of endoscopy for management of obstructive salivary gland diseases. Francis Marchal, MD, PhD, Associate Professor in the Department of Otolaryngology-Head and Neck Surgery at Geneva University Hospital in Switzerland, was one of those innovators. In the early 1990s, he recalled, endoscopy was being used (notably, by Gundlach and Hopf6) in conjunction with intracorporeal lithotripsy to fragment salivary gland stones. Technical problems (caused by instruments that were too long and fragile) seemed to impede the spread of the technique. In partnership with the Federal Polytechnic School of Lausanne, Dr. Marchal began to experiment with small-sized flexible endoscopes to see whether it would be possible to have adequate vision of the ductal system, and then to treat people with submandibular obstructions without removing the gland. With these initial forays, visualization into collapsed ducts was very poor. Dr. Marchal tried a 1.5-mm flexible scope with a rinsing system, and found that flushing the gland with saline solution was the key to greater visibility. Finally, he began collaborating with the Karl Storz Company, which had a semi-rigid 1-mm diameter scope. This scope was modified, and various outer sheath systems were designed and customized (tip, curve, etc.) in order to facilitate access to the ducts. A specific surgical technique using various dilators, and specific baskets for stone retrieval, also designed by Dr. Marchal, were set up. The Storz system (the main company manufacturing these scopes) contains a rinsing channel and a working channel with an external diameter ranging from 0.89 mm to 2.2 mm, according to different models of scopes.